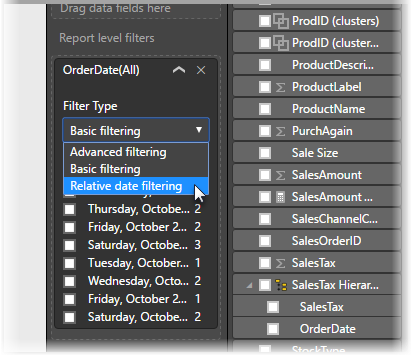 With the relative date slicer or relative date filter, you can apply time-based filters to any date column in your data model. For example, you can use the relative date slicer to show only sales data that's happened within the last thirty days (or month, calendar months, and so on). And, when you refresh the data, the relative time period automatically applies the appropriate relative date constraint. 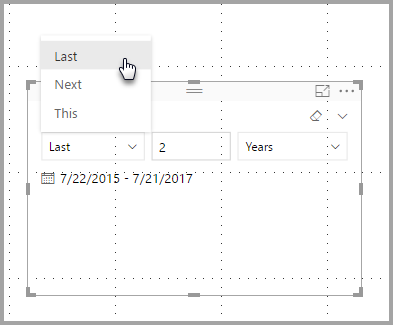 You can use the relative date slicer just like any other slicer. Simply create a slicer visual for your report and then select a date value for the Field value. In the following image, the OrderDate field is selected. 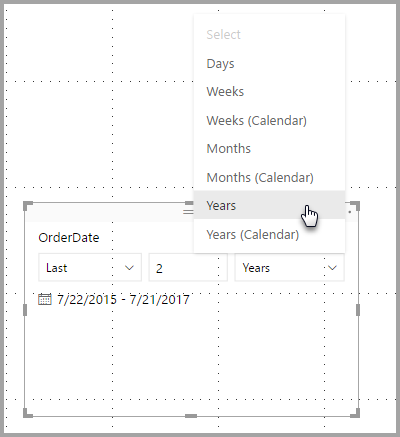 Select the carat in the upper-right corner of the relative date slicer and a menu appears. For the relative date slicer, select Relative. These selections are shown in the following image. The next (middle) setting in the relative date slicer lets you type in a number to define the relative date range. If you select Months from that list, and input 2 in the middle setting, the following would happen: if today is July 20th, the data included in visuals constrained by the slicer would show data for the previous two months, starting on May 20th and going through July 20th (today's date). In comparison, if you selected Months (Calendar), the visuals constrained would show data from May 1st through June 30th (the last two complete calendar months). 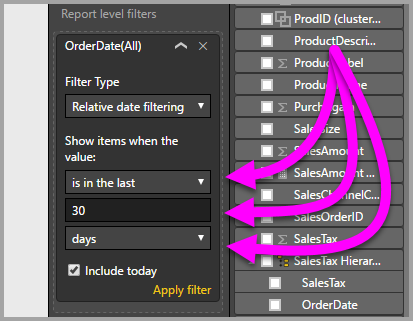 You can also create a relative date range filter for your report page or your entire report. 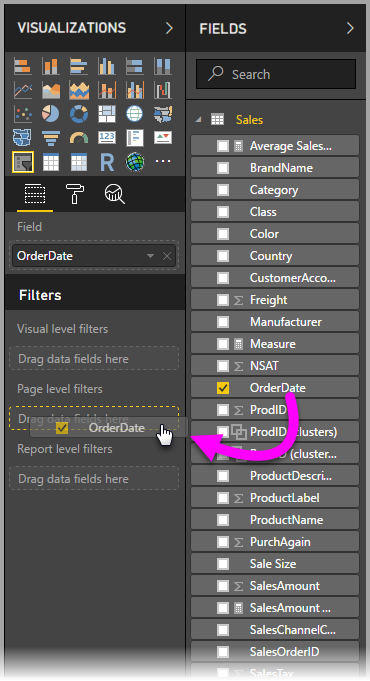 To do so, simply drag a date field into the Page level filters or the Report level filters areas in the Field pane, as shown in the following image. Once there, you can modify the relative date range in a similar fashion to how the relative date slicer is customized. Select Relative date filtering from the Filter Type drop-down. 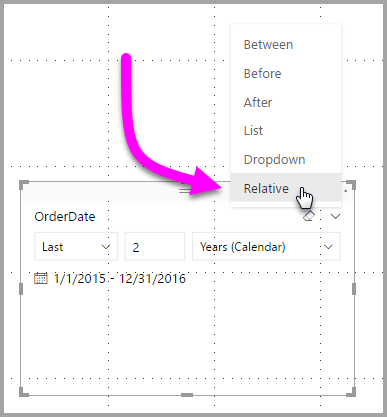 Once Relative date filtering is selected, you see three sections to modify, including a middle numeric box, just like the slicer. And, that's all there is to using these relative date constraints in your reports. The following limitations and considerations currently apply to the relative date range slicer and filter. 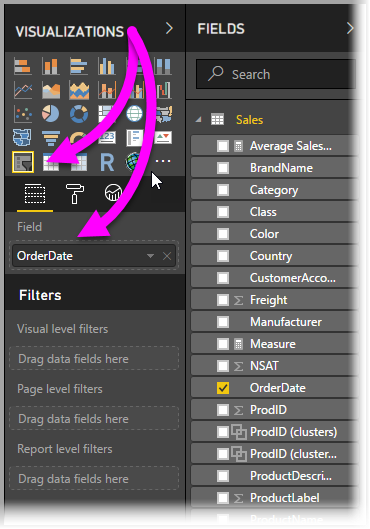 Data models in Power BI do not include time zone information. The models can store times, but there's no indication of the time zone they're in. The slicer and filter are always based on the time in UTC, so if you configure a filter in a report and send it to a colleague in a different time zone, you'll both see the same data. However, if you aren't in the UTC time zone, you might see data for a different time offset than you expect. Data captured in a local time zone can be converted to UTC using the Query Editor.